The Vanguard Group published recently its “How America Saves 2018” report, a trove of data on more than 4.9 million retirement savers in 401(k)s, 403(b)s and other defined-contribution plans. 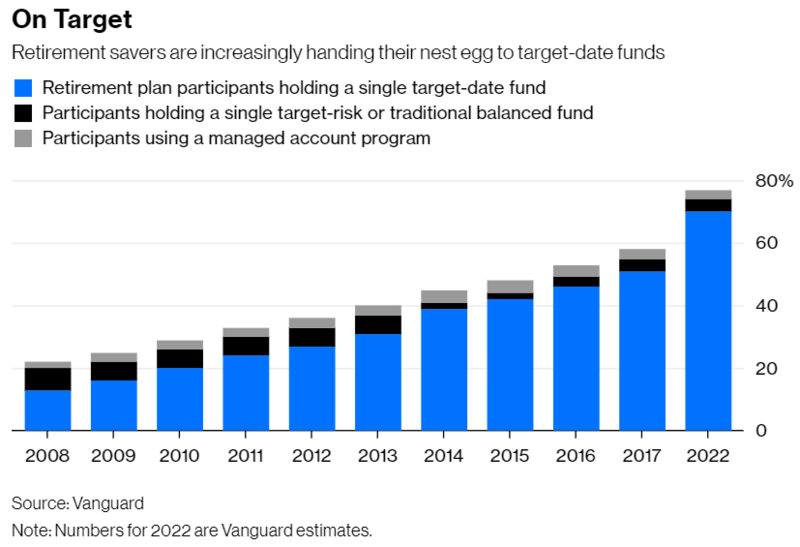 My colleague Barry Ritholtz has already noted many of the highlights, but one detail deserves more exploration: Target-date funds are taking over retirement accounts. The numbers are astonishing. Roughly half of retirement savers invested their entire account in a single target-date fund in 2017. None did so as recently as 2004. Vanguard estimates that number will grow to 70 percent by 2022. Remember, millennials: Red is good. Millennials are probably tired of hearing that they’re not doing as well as their baby-boomer parents. But with every 1,000-point drop in the Dow Jones Industrial Average, their fortunes are brightening. If they doubt it, millennials need look no further than mom and dad. The baby boomers entered the workforce from roughly 1966 to 1984. They couldn’t have timed it better because U.S. stocks were in an epic funk during those 19 years. The S&P 500 Index gained just 3.2 percent annually while inflation grew by 6.5 percent, which means the real value of U.S. stocks declined by a stunning 3.3 percent a year for nearly two decades. I wrote a column earlier this week about U.S. workers’ widespread and well-founded anxiety about retirement, and how, in the absence of any meaningful public or private efforts to address those concerns, many plan to work into their 70s. 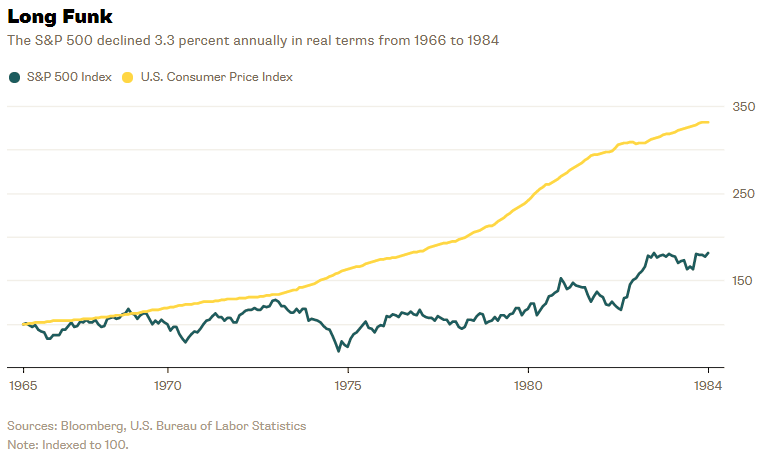 I proposed that this newly-contemplated fifth decade of work presents a golden opportunity to fund retirements quite cheaply — for just $16,500 per worker by my estimation — assuming that: 1) We set aside that money at the beginning of workers’ careers in order to leverage the magic of 50 years of compounding returns, and 2) We invest the money in a straightforward 50-50 U.S. stock-bond portfolio. U.S. workers are worried about retirement, and who can blame them? We’re living longer. Social security looks increasingly overburdened. Employers have ditched pensions in favor of laughably inadequate 401(k)s and other defined contribution plans. According to Willis Towers Watson, a human resource consulting firm, 71 percent of full-time employees believe that social security will be “much less generous” when they retire than it is today — and 76 percent believe that they will be “much worse off” in retirement than their parents. In the absence of any meaningful effort by the public or private sector to address those fears, many workers are doing the only thing they can do: planning to work longer. About 47 percent of full-time employees who are members of a retirement plan told Willis Towers Watson that they would work longer if they thought that their retirement income would fall short (the other, less popular, options were to save more, live more frugally, or hope for the best). And 28 percent of full-time employees expect to work past the age of 70 (including 5 percent who expect to never retire). Ted Benna, the man widely regarded as the father of the 401(k) plan, recently reflected on his creation – and he wasn’t happy. Benna laments that 401(k)s have become so complicated and so expensive and so rife with opportunities for mistakes. As we know, 401(k)s and other defined contribution plans have become the go-to retirement plans for private sector workers. 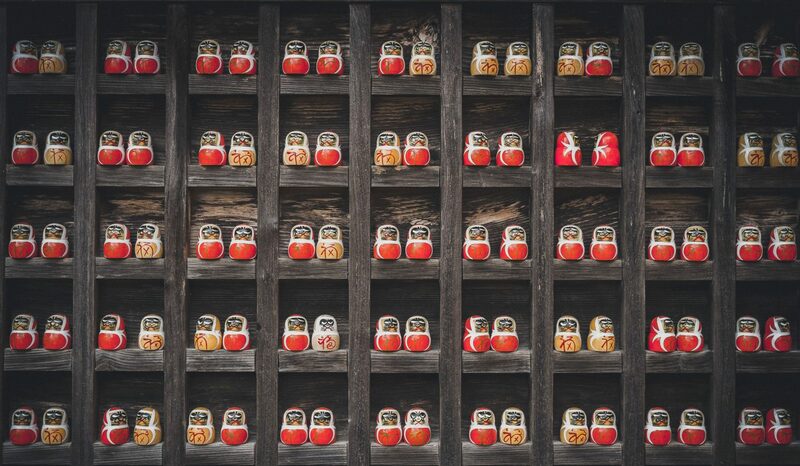 According to the Employee Benefit Research Institute, 84 percent of private sector workers who participated in an employment-based retirement plan were enrolled in a traditional pension in 1979. By 2011, 93 percent were enrolled in a 401(k) or other defined contribution plan. (401(k)s are the largest and most common type of defined contribution plan).